The ratification of the 18th Amendment in 1919, making the manufacturing and consumption of alcohol illegal, affected every American in the 1920s, whether they were drinkers or not. The ripples of a dry nation created a wave of crime and corruption, and directly impacted the United State’s economy. For Julius Lehrkind, Prohibition was not only a near fatal blow to his livelihood; it was a blow to his soul. His brewing knowledge was among the few things he was able to smuggle aboard as a stowaway on a boat from Germany. Brewing was central to his character. So it’s not surprising that in the years leading up to Prohibition, Julius was a vocal defender of a person’s right to imbibe in moderation. 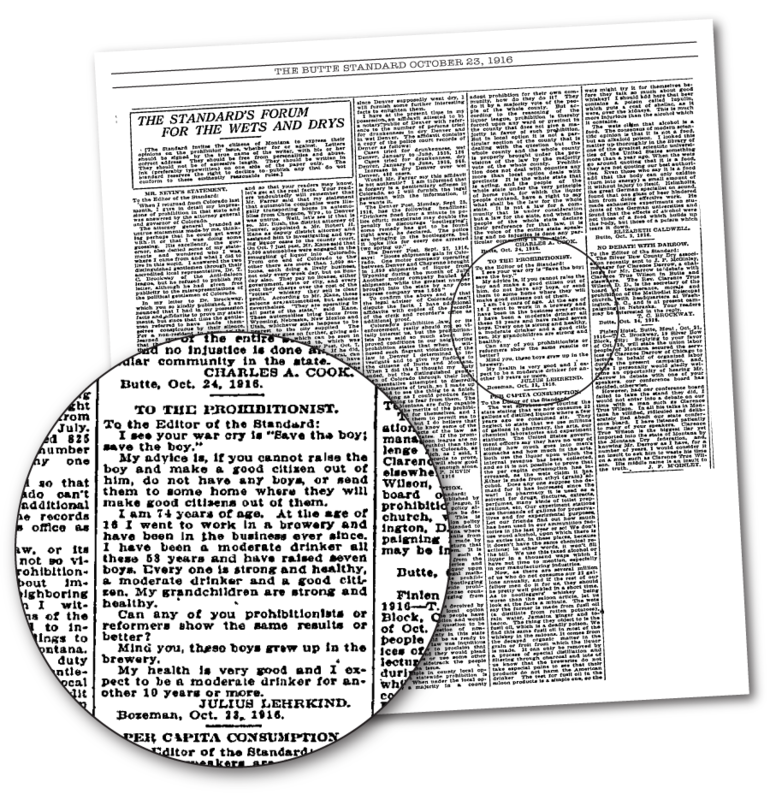 A 1916 letter to the editor of the Butte Standard argues this stance. A letter from Julius Lehrkind to The Butte Standard. I see your war cry is “Save The Boy; Save The Boy.” My advice is, if you cannot raise the boy and make a good citizen out of him, do not have any boys, or send them to a home where they will make good citizens of them. I am 74 years of age. At the age of 16 I went to work in a brewery and have been in the business ever since. I have been a moderate drinker all of these 58 years and have raised seven boys. Every one is strong and healthy, a moderate drinker and a good citizen. My grandchildren are strong and healthy. Can any of you prohibitionists or reformers show the same results or better? Mind you, these boys grew up in the brewery. My health is very good and I expect to be a moderate drinker for another 10 years or more. JULIUS LEHRKIND. Bozeman, Oct. 23, 1916. Three years after Julius wrote this letter, alcohol was illegal. Julius passed away before he could see the repeal of Prohibition. He was said to have died from a broken heart. 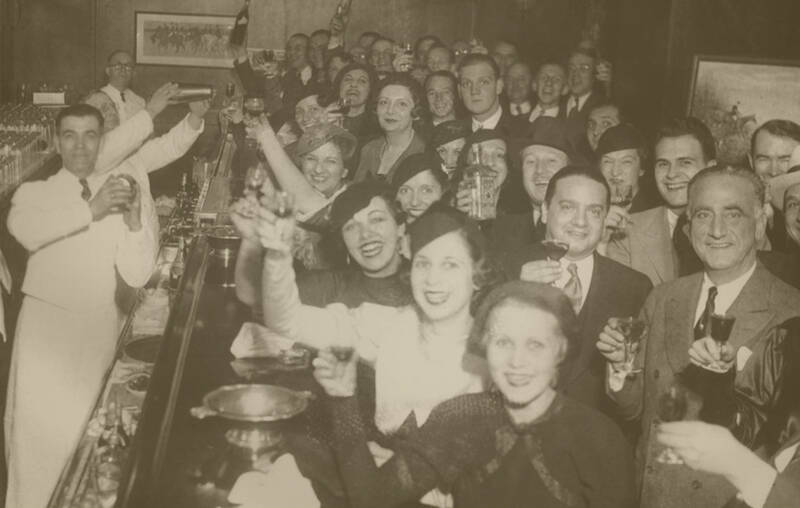 After 13 long, dry years, Prohibition was finally repealed on December 5, 1933. So every December 5th, Julius Lehrkind Brewing raises a pint in moderation to celebrate “Repeal Day” and to honor our craft beer heritage. FIND OUR CRAFT BEER HERE. AND RAISE A PINT TO HISTORY.